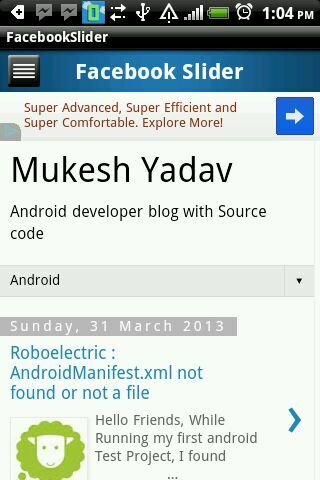 Hello mukesh, I can not able to find your source code for this blog. Can you please help me out with that? Actually the link was broken during upload....No worries ,I will update the link tonight. Hi Mukesh ,can you provide the link for source code? 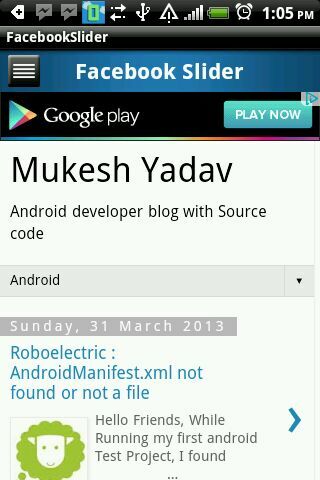 Hello Mukesh, there are no source code link there. How can I find this, can you please tell me? I have provide complete source code at the end, below the image. Now I made that link in bold....hope you find that. Hello sarvesh please cross check again at the end I have provided the complete source code for download. What about multiple activity starting from side menu? That can share the common left menu? Thanks....great Job.. You have saved our time..
Hi.Mukesh, i have use your code for FB style sliding menu and it's working fine.But i have one problem with it when my activity is called every time this menu show first for few seconds then my activity view appear, i don't won't to show that menu what can i do ? plz help me. You mean the menu button at top left?? if yes then use visibility gone in your xml. Thanks, Chirag for sharing the code. I have another one issue if you can solve it plz help yaar. I have HorizonatlScrollview and it that i have five to six imageviews now when i scroll it and select any button it's working fine. Suppose the width of each imageview is 50dp, so total is 50*6=300dp. Now , when you are at 6th positon it means width is 50*6 = 300dp. When you tap on 5th image , it means width is 50*5 = 250dp. Check my horizontal listview tutorial(blog), there I am doing the same. May be it gives you some Idea.In that blog I am moving the imageview on clicking of left and right arrow icon. I have one issue...plz can you guide me for that.. I m doing Webservice call from android to PHP server.In my doInBackground() URL post and getback JSON formate data from server then i just embed that data to my control. What i have problem that suppose if there is internet connection slow down and then my loader is just running no untill no response is coming back from server.So after sometimes my app will crash in doInBackground(). So how can i handle this doInBackground() crash issue by showing alert to user that there is some problem in server plz try again later like that..
Hi...muskesh i have tried your code it works fine.. I have one another issue. I m dynamic binding Listview using adapter and dat will be coming from Webservice. In that i bind text as well as images all items has seperate logo which also comes from Webservice URL and that URL i download and convert into bitmap rounded corner for that i used your code which you posted on your blog. My problem is when my data loads it will bind ti listview and logo will call in doInBackground, when i scroll down listview even sometimes my logo comes and bind also loader is shown i have INVISIBLE loader in onPost(). Sometimes first item logo will repeat in all items and then above that logo loader image is coming and after sometimes that logo will be changed..
First of all let me know ,are you using lazy image loader for imageview or not ?? Means i don't get your point..
means when i scroll down of listview then getView() call for getting and binding images. So when i scroll down some first image of list item will repeated in all items and above that image loader is moving...and after some times loader will gone. I have one confusion for dynamic binding data in listview What adapter shall I use? HashMap is reliable? I m using Hashmap but it will bind random data everytime which i don't want then what i have to do ? I suggest you to try the binding of image using lazy image loader ,I am pretty sure that It will solved your problem. Regarding, the above hash map issue...try with using linked hashmap. But,Its good if you used lazy image loader...please try using it and then let me know if you still facing any issue. Can u provide me ur mail id so that I can send you the project for reference .Its urgent and it will be a great help . Sure, let me check it out that, then back to you .. I have one issue,if you have ans of it. I want an event or method which call only ones when my app is launch and also it will be called when my app is comes in foreground after re -openining it. Because i have to check user status by calling WS. If i get user status block then i have to redirect user on login screen. Right now i have call this WS on every activities onResume() method so if user minimize app and then open again app onResume() is called and check user status from WS. Plz let me know if you know any method in android like above method in iPhone. didbecomeactive() deligate. But your problem is that you want to call your webservice only when your application comes in forground first time not on switching b/w the activity. You can do this by making an application level variable or static boolean variable(isStatus) initially set it as false. and in onResume check it like this. yes Mukesh i got your point, now after call my webservice i have to change isStatus = true b'cas i don't want again call webservice when i come back same activity from another activity. And now my isStatus is became true so it will not call Webservice again in onResume() but suppose i have minimized my app and after 2 days i will open my app then my last viewed activity is onResume() at that time i have to call Websevice. so how can i manage that isStatus variable value ??????? 1. Have you using tabactivity?? if yes the on the main tab activty you have to forcefully close the instance of your app on back button pressed method and also set the staus = false. First i am not using TabActivity..
Then suppose user have pressed Home Key of device then my app will also minimize..
also i am stuck right now it one problem,i have to hold my current activity untill finishing my AsyncTask can we do that ? what i have to do, i have to make Webservice call and in response i get some value after i get that response my current activity flow started further meanwhile current activity i have to hold...Is there any event or method which make Asyncrouse task to Syncronous? U saw my project ? Can you check and tel me wts the problem behind it r can u solve and dend it to me . Suppose if i making Web service call for parsing data which is asynchronous process and at middle of parsing my device lost internet connection then right now my app will crash.How to handle this situation. You have to use network monitor code which trigger whenever network is down. Hello Anand, please go through the blog I just update the downloaded link. Please let me know the issue you are facing. Thanks Mukesh It worked for me........really nice tutorial. you have to remove the code and call of fragment and instead of that om option menu selection you have to do something like this.. Thanks..bro save lot of time and learns a lot.. Thanks for sharing code.It work perfectly.But i want to open slide menu from right side not from left.Can you tell me how to do it. Do you know how can I put the slide Left-to-Right in your app? 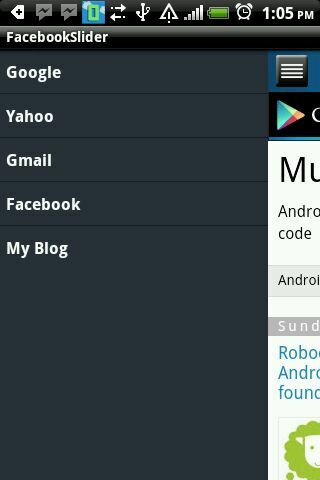 Use Navigation drawer code which will be available on android developer site. This is fine demo. But this created a major problem for me. In android jelly bean when i run my app using this same code first time sliding menu didn't open means working properly but when i ran this project in kitkat or emulator then at the app start sliding menu was open which i really want. So please can you tell me why this is happening?